When some stars die, they explode as supernovas and their debris fields (aka, "supernova remnants") expand into the surrounding environments. There are several different types, or categories, of supernova remnants. One of these is known as a mixed-morphology supernova remnant. This type gets its name because it shares several characteristics from other types of supernova remnants. More specifically, particles that have been superheated are seen in X-rays in the center of the remnant. This inner region is enclosed by shell structure detected in radio emission. 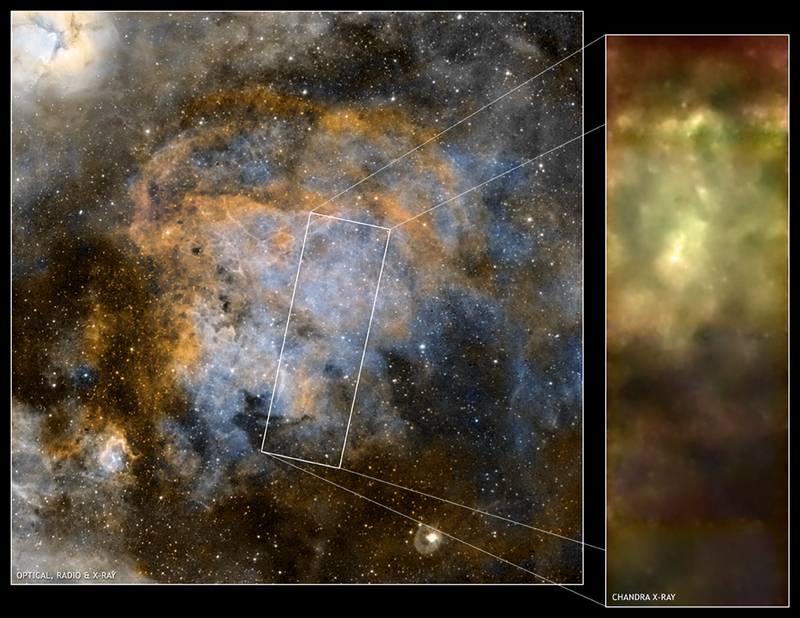 This composite shows a classic example of mixed-morphology supernova remnant known as W28. Each wavelength shows detailed structure of how the supernova shock wave is interacting, or has interacted, with the complex cloudy environment which surrounded its parent star. In this image, the stars and fine structure in the background are seen in optical light (grey and white) by the Cerro Tololo Inter-American Observatory in Chile. 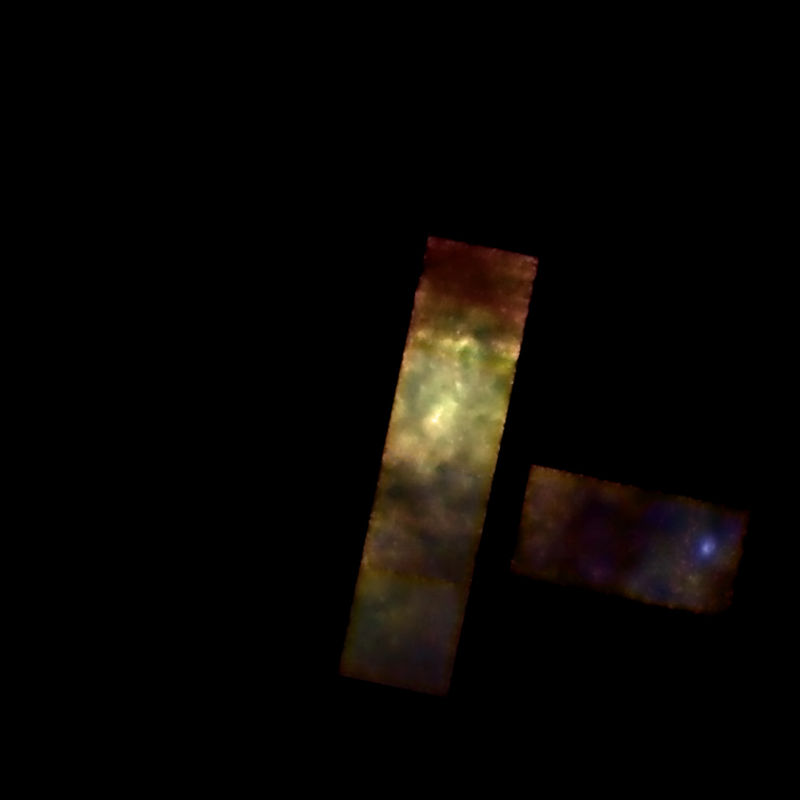 The radio (orange) data were obtained by the Very Large Array in New Mexico, while the blue in the wide-field view comes from the ROSAT satellite (X-rays). Data from NASA’s Chandra X-ray Observatory give new detail into the heart of W28 as seen in the inset. In this close-up view of the center, low-energy X-rays are colored red, the medium are green, and the highest found by Chandra are blue. The Chandra data show the shape and extent of the high-energy emission in the central region. By studying W28 and others like it, astronomers hope to better understand the complexities involved when a star explodes in a crowded neighborhood. Credit Chandra X-ray: NASA/CXC/HSC/J. Keohane et al. ; ROSAT X-ray: NASA/ROSAT; Optical: NOAO/CTIO/P.F. Winkler et al. ; Radio: NSF/NRAO/VLA/G. Dubner et al. Coordinates (J2000) RA 18 00 24.80 | Dec -23° 25´ 40.30"
Color Code Chandra (Low-energy X-rays are red, Medium are green, High are blue); ROSAT X-ray (Blue); Optical (Grey); Radio (Orange).